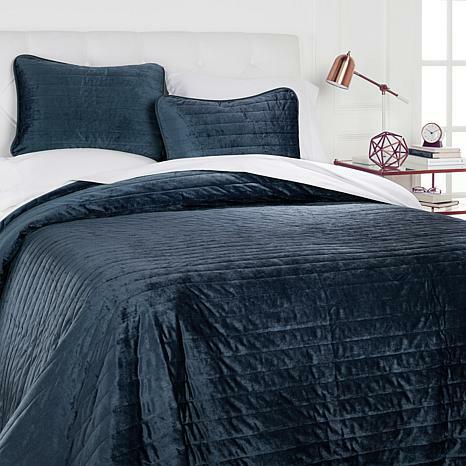 Create a new mood with the casual elegance of this velvet quilt set. It serves as the perfect springboard for your style. Layer on your taste with soft sheets and decorative pillows, and enjoy living vividly with this set on the bed. Your style sets the tone, and it begins with color. 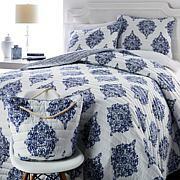 I love this quilt set. Dog hair does not really stick to it so I am very happy. It is very soft and looks really good. This is absolutely beautiful. I couldn't be happier with the purchase. The color is perfect, the fit is perfect and I love it. I placed on my bed in November and removed it at the end of February. It has been repeatedly washed and dried due to dogs. The color of the green has remained true and looks brand new. Would love to own one in white. The drape could be longer on the sides for a king sized bed but other than that a great purchase. I ordered in the Blue and I am extremely happy with this purchase. The velvet is very soft and the color is extremely vibrant. The quilt is not very thick but still very comfortable and perfect when paired with a nice blanket for the fall weather.